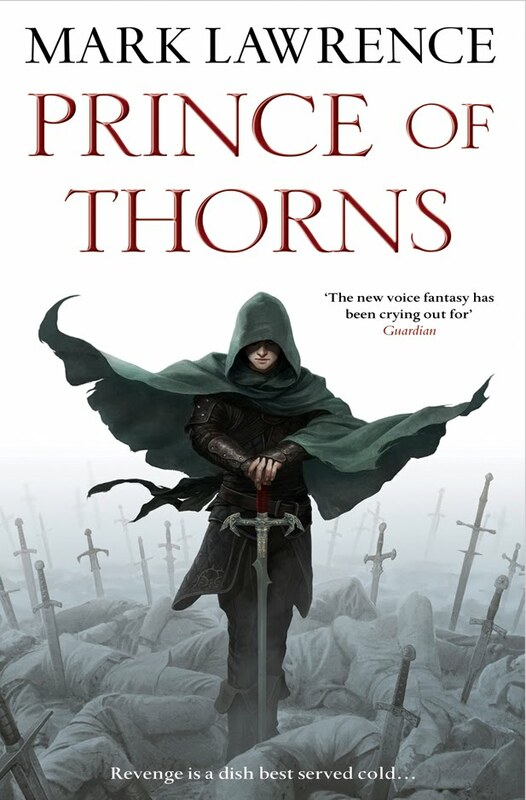 Mark Lawrence's Prince of Thorns (Canada, USA, Europe), the first volume in The Broken Empire series, is another high profile fantasy debut which will be released later this year. With Voyager really pushing this one in the UK and with Ace acquiring the US rights for the highest advance in the last 7 years, I decided to invite him for a little Q&A. - What's the 411 on Mark Lawrence? Tell us a bit about your background? When I was a kid I wanted to get into science, preferably flying a rocket to Mars. In the end the closest I got to my rocket was applying the equations of orbital dynamics as constraints in tracking algorithms (and some other bits and pieces I can't talk about) - I was technically a rocket scientist for six months! Most of my research has been spent in more abstract mathematics though, with some robots and vision systems thrown in for good measure. These days I can only get to work when I'm not looking after my very disabled little girl. You may notice me mention her a fair bit, but for the past seven years our lives have revolved around her needs and she dominates every day, so she’s a huge factor in my life and writing experience. In between my job and caring duties I manage to get a bit of writing done too, mostly late at night. The interest in writing grew over many years, a very gradual process. The start was an addiction to fantasy books, then to dungeons and dragons (as a teen), that turned into involvement in text-based play-by-mail games, and finally into writing short stories, then longer ones on online writing groups. - Without giving too much away, can you give us a taste of the tale that is PRINCE OF THORNS? I hope it's an entertaining read of the swords-and-some-sorcery type with deeper themes for anyone with an eye for such things. We follow the fortunes of an exceptional but very human young man who is given to extremes. Part of the challenge for me was to present a character who can and does do terrible things and yet to keep the reader engaged on an emotional level. On the surface the tale echoes some of the great themes in fantasy (and the wider world of story), the lost son returns, but I think I colour outside the lines more than I colour inside them. My taste is for discovering a story as I go, both while I’m writing my own, and while I’m reading somebody else’s. Generally I don’t read the blurb on the back or trawl reviews. I love to read reviews _after_ I’ve finished the book, not before I start. So in that vein I’m loathe to offer a potted plot or extol the virtues of the setting. It’s the writing that makes a book succeed or fail, many a great read sounds dull in summary, many an eye-popping summary turns into a dire read. For people with a different modus operandi, there’s the blurb on my website and all the reviews I know of are linked from there too. Better to trust the impartial observer than the author in any case! I wrote the book in many short bursts over a long period, for my own entertainment and to keep the interest of few writing friends. Mostly I was writing for enjoyment and to get better at writing through practice and experimentation. When it was done I put it away with the two books I'd written before it. I'd never thought that I would be published - it seemed there were too many good writers in print and a vast sea of untapped talent knocking on the doors. The odds looked similar to the lottery and it takes effort to enter into that contest, it can be time-consuming and disheartening. I prefer writing. One persistent friend kept buying me books on writers' markets though. In the end guilt at her spending her money like that drove me to write to some agents, and to my enormous surprise I got an agent and then a publishing deal in short order. I was sitting reading a story to my daughter when I got the call. Afterward I put her over my shoulder and went into the kitchen to tell my wife. She thought from my face that Celyn had had another seizure or died on me! - How would you describe your work to someone who hadn’t tried your books before? Quick moving, well observed, emotional, sometimes brutal. 'Prince of Thorns' is part of a trilogy, although pretty much self-contained. I understand the plan is to release the books a year apart. The tentative title for book 2 is 'King of Thorns'. Book 2 and 3 take the story into new territory, both literally and metaphorically. In book 1 we discover who Jorg is, in books 2 and 3 we discover what he becomes and where it takes him. - What was the spark that generated the idea which drove you to write The Broken Empire in the first place? I wanted to see how dark a main character I could write without losing engagement with the reader. It started off as an experiment. I kept getting darker, expecting my readers to cry off, and none of them did. I think I write clever non-linear tales that can be read without effort. I hope that I can bring people and situations to life with unobtrusive description, and capture the essence of certain moments. I'm always impressed by the way some writers capture the interactions of women with other women, particularly the small talk and different levels of communication. I would like to be able to write 'chick-lit', not because I would then go and write some, but because those skills would make me a better writer. - Were there any perceived conventions of the fantasy genre which you wanted to twist or break when you set out to write PRINCE OF THORNS and its sequels? No. I'm not an iconoclast, I just don't care about icons. There's a difference. - Cover art has become a very hot topic of late. What are your thoughts pertaining to that facet of a novel, and what do you think of the covers that grace your novel? Until very recently it was never something I'd given much thought to. Some covers I like, some I don't. I'm now aware of the minimalist UK trend, the more traditional US style (huge generalisms here), and the arguments around the role of the cover in the 'fantasy stigma' debate. All interesting stuff. I'm sure most of your readers will know what most of the wider public don't, and that is that authors generally have no say in their cover choice. 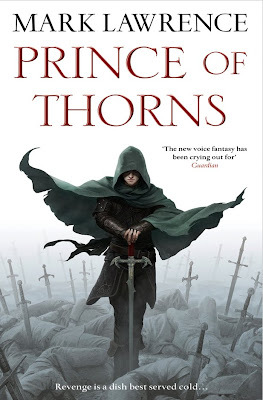 I like the cover on 'Prince of Thorns' very much. I have a blow-up of it on my wall and it's excellent work with the field of swords adding something chilling to it. Since I first saw it I have come to realise that there are a lot of 'hooded men' covers out there right now. Even so, it has originality to it and I think Jason Chan has done a great job. Could the genre do with some more cover diversity? Sure. - The advance praise and the amount paid to acquire the US rights for your debut have created a very positive buzz surrounding the release of PRINCE OF THORNS. How happy are you about that? Are you afraid that this might raise readers' expectations too high? I don't think I could reasonably be unhappy about a very positive buzz. I hope it's been created by the reaction and reviews of early readers rather than speculation on my advance! I think that to some degree publisher push (though extremely important) and talk of advances (though helping adapt my house with hoists etc for my girl) actually create a backlash amongst free-thinking reviewers and readers who don't like to be 'told by the man'. People like to discover books themselves. So I think my good reviews so far have been earned rather than gifted. As for reader expectation - well, I'm just happy if my book gets read. I hope it can meet expectation, if not, I apologise in advance. I don’t feel entitled to success. I’m very surprised to be here in the first place. - The fact that there is a website dedicated to your work is an indication that interaction with your readers is important to you as an author. How special is it to have the chance to interact directly with potential readers and soon-to-be fans? My writing grew up on online writing groups so I've always had a close and immediate interaction with my readers. If I just dropped my work into a black hole and that were the end of it I would be very unsatisfied. I want to know what worked and what didn't. I used to read a ton of fantasy. That slackened off and I’ve not read much in the last ten years. I’m very impressed with George RR Martin though, and Robin Hobb creates and uses relationships with rare skill. Outside the genre my favourite authors include John Irving, William Golding, and Bill Bryson. In the last year I’ve been trying some of the more recent fantasy authors and folk like Abercrombie, Rothfuss, Bakker, and Weeks are all on my ‘to do’ list. Lord knows! Um ... the NYT because it’s the judgement of many people voting with their pockets. Also my mum would be more impressed! But I’ve never won an award of any sort and I’d be very excited to be nominated for the smallest prize on the block! - More and more, authors/editors/publicists/agents are discovering the potential of all the SFF blogs/websites/message boards on the internet. Even though PRINCE OF THORNS has not yet been released, do you keep an eye on what's being discussed out there, especially if it concerns you? Or is it too much of a distraction? Yes it’s too much of a distraction and yes I watch it like a ... well hawks probably wouldn’t be that bothered would they. I watch it like someone who should know better. Great interview. More of these please, Pat! Definitely interested in getting the book. In the spirit of that question on 'interaction', if any of the Hotlist readers have more questions or want more detail I'm happy to answer here. @ediFanoB And if your Dutch is good you can get the Dutch edition 'Prins der Wrake' which comes out in April! Can fantasy ever tell the truth? The Ultimate Steven Erikson giveaway! The SFF Debut of 2011??? Take two! The SFF debut of 2011??? THE CRIPPLED GOD is a hit!